The last two years have witnessed deterioration in the global security situation characterised by increasing tensions among major powers. The threat perceptions of the US, China and Russia vis-a-vis each other have sharpened. There is stiff competition among them to dominate the strategic space in different parts of the world. This has led them to formulate national security strategies which are more assertive, aggressive and competitive. There is lack of consensus in resolution of conflicts in Afghanistan and Syria. There is no concerted effort in meeting the challenge of the Islamic State. It is in this fractured security environment that India has been making special efforts to project itself as a leading power commensurate with its economic and military potential. 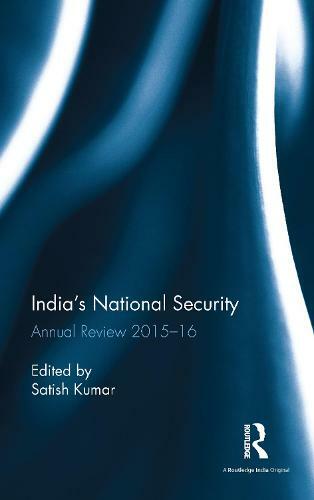 This fifteenth volume of India's National Security Annual Review undertakes an incisive analysis of India's endeavours to maximise its gains with respect to its strategic partners. The volume also focuses on the new dynamism that India has injected in its relations with countries in the Middle East and the Asia Pacific. India's threat perceptions in its extended security zone, critical aspects of its strategic preparedness and complex issues regarding its internal security have been thoroughly examined. With contributions from experts from the fields of diplomacy, academia and civil and military services, the book will be one of the most dependable sources of analyses for scholars of international relations, foreign policy, defence and strategic studies, and political science, and practitioners alike.